The Summer Studio. 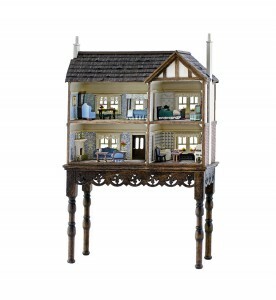 Nell Corkin’s 1/144-scale building is only 1 3/8″ wide and 1″ tall. Nell Corkin is one of the most fascinating artisans you will ever meet—personally and professionally. The IGMA Fellow has worked in film with the likes of John Dykstra, Steven Spielberg and Ridley Scott, on Universal Studio rides, and on scenes using larger than life props. Since 1993, however, she has focused on the smallest of small—1/144th scale—and her creations continue to evolve and stretch the boundaries of what is seemingly possible. Meet Nell, in her own words. Nell, You’ve been involved with miniatures since you were a child—do you remember the defining moment when you decided to pursue the art form as a career. The “Aha!” moment for me was seeing the very first TV program about the making of Star Wars. There were people doing what I liked to do, and doing it for a living. I was living in Los Angeles then, so I asked a friend who was an art director about getting a job and he told me they didn’t hire “girls.” (That is something no one should ever tell me!) I told him he needed to see my work, so he came to my apartment, saw the 1/12 building I was working on, and was impressed enough to get me an interview at a model shop. As I walked in, I decided that I wasn’t going to leave until they gave me a job. I talked with the owner and he said he would call me. I thought “right …” and asked him if I could hang out in the shop for a while. I began talking with the guys and showed them the miniature sushi and other things I was making at the time. One by one they disappeared into the office, and it wasn’t long before the owner beckoned me in and asked me how much I wanted per hour. You worked on models for a number of movies. Can you name some of them? I was fortunate to be working in the film industry in the 80s, which was really the golden age of what are now called “practical” (as opposed to computer generated or CG) effects. If you needed a dancing daisy, a Death Star, a space shuttle, or a talking gopher, you had to make the actual item and film it—there was no other way. Some of the movies and projects I worked on included Space Camp, Spaceballs, She Devil, Back to the Future II, My Stepmother is an Alien, Ghost Dad, Coming to America, Gremlins II, Child’s Play II, Amazing Stories, Shakedown, Duracell commercials, a Universal Studios earthquake ride, and many other projects. 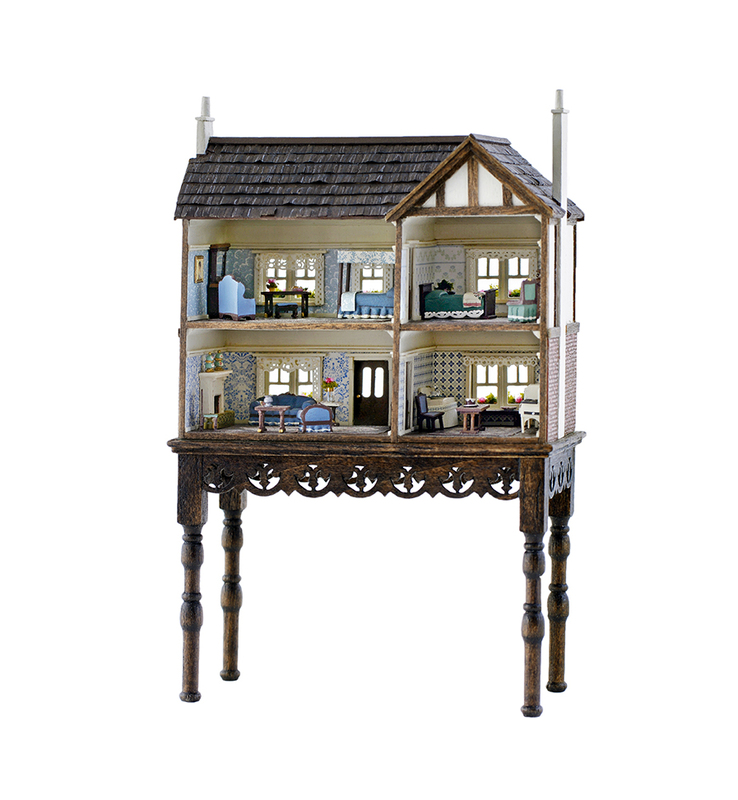 Miniatures have been featured in many films and series lately: The Miniaturist, Hereditary, Downsizing, Sharp Objects. What are your thoughts on how far it’s come? CG has made many amazing things possible that simply could not have been done with practical effects. I’m prejudiced, of course, but I still feel that shots using models often have a lot more depth and can be more convincing if the models are good and they are shot well. When either is done badly, it makes me cringe. The movie miniatures that impress me the most are the ones I don’t spot when I see the film—which is the way it’s supposed to be. I’m not a huge horror fan, so I probably won’t see Hereditary, but Downsizing looks intriguing. The Miniaturist looks lovely and used pieces made by Mulvany & Rogers and other fine English makers; but I found it incredibly sad and wish we had found out more about the miniaturist. I’m looking forward to the upcoming Steve Carrell movie, Welcome to Marwen, about a graphic artist who creates a Barbie scaled model village as a form of expression and healing after a brutal beating. 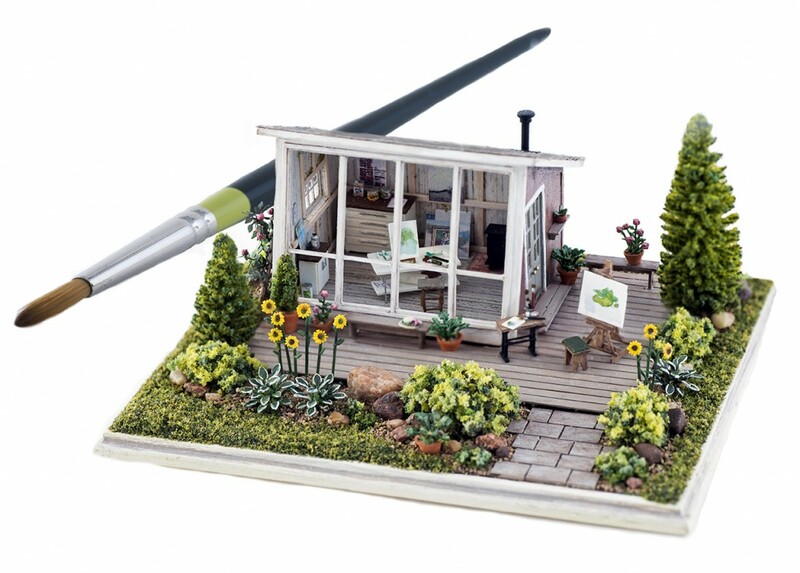 It promises to give insight into some of the reasons why we create miniature art. Explain your attraction to 1/144 scale and why it appeals to you as opposed to 1/12 scale. From the first time I made a “dollhouse for a dollhouse” the appeal was the challenge of making a 1/44-scale house that would look as good as a nice 1/12-scale dollhouse. Although I can use some of the same materials that would be used to make a 1/12-scale house, I have to use them in different ways, or come up with something completely different. 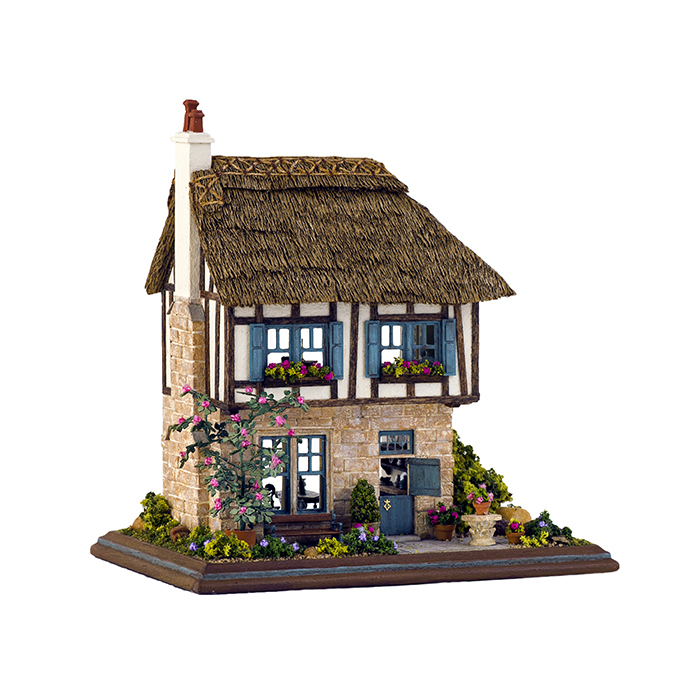 I had to invent a way to do thatched roofs and pargeting (decorative plaster work) for some of my English houses, for example, and I use paper instead of wood for shingles. The real delight for me is in creating the accurate, realistic details that will bring my pieces to life. Often, I will think “I can’t possibly do that in 1/144 scale!” only to find that actually, I can. Some of those “impossible” pieces include a bird cage, a clavichord, a Dutch cradle, a cherry pie in progress on a kitchen table, a suite of medieval furniture and a fluffy orange cat. 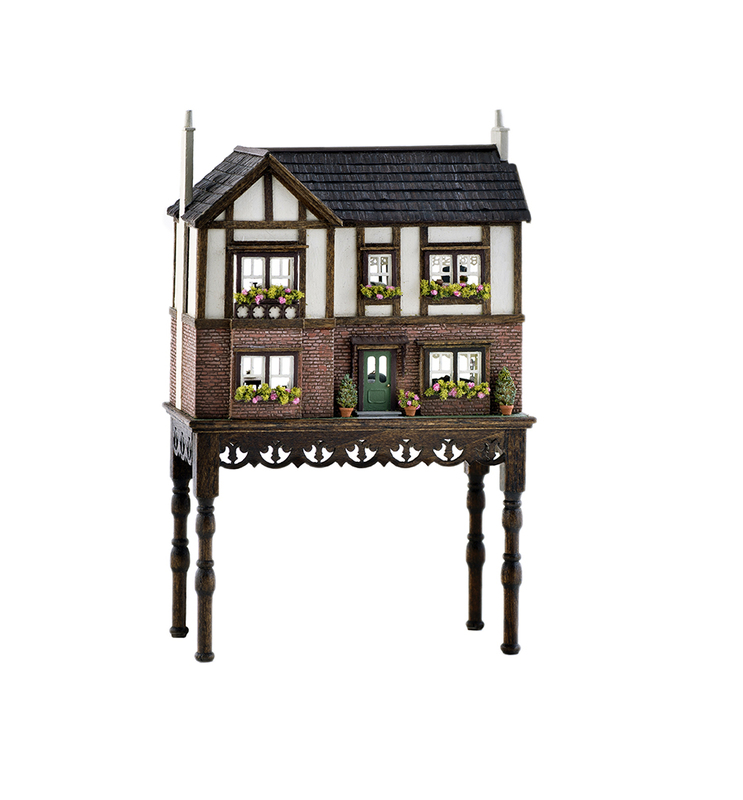 This is probably a good place to mention that I make miniature dollhouses, not architectural models. It’s a slightly different aesthetic. Although I certainly can make buildings that look like real full-size buildings, dollhouses are more fun because I can do anything I want. Why do you think people are fascinated by the art form of miniatures? Now, there’s a question! I can’t even tell you exactly why I’m fascinated, although I always have been. Maybe it has something to do with the fact that we have to be close to miniatures to really see them. When we do that, they fill our field of vision and for a moment, at least, we enter another world. It’s literally a change of focus, and almost meditative in the way … distractions recede as we concentrate on a tiny object. If you watch people at a museum, they will pause at a piece they love, and as often as not, start to smile. Tell us about your stunning baby houses. I have always been fascinated by Dutch baby houses, but didn’t feel I could make a satisfactory cabinet. When I saw Gilbert Mena’s work at a show, I thought our styles would suit each other well, and the collaboration began. He created a beautiful seven-room version with trompe l’oiel doors and marquetry floors. I finished and furnished the rooms, taking ideas from a number of different actual baby houses. There were two bed chambers, a porcelain room, a salon, a kitchen, a dining room and a two-story grand entrance hall. It was the most expensive piece I had made up to that point, but it sold almost immediately the first time I showed it. I’ve only made four in that size, and each is a bit different. The Baroque Baby House in Kaye’s collection is a three-room version of the Dutch baby house, with a gorgeous inlaid walnut and exotic wood cabinet by Gilbert and furnished rooms by myself. 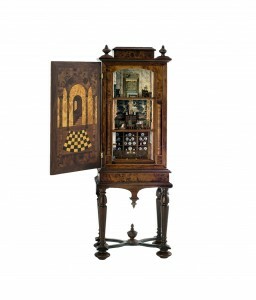 Both the cabinet and the rooms are original designs inspired by late 17th- and early 18th-century pieces. It’s the first three room baby house Gilbert and I created. Your family “steered you away” from going to art school. What did they think when you made a successful career out of fine-scale miniatures? My family always appreciated my creative side, but I think perhaps my rather conservative parents were afraid I would fall into a Bohemian life style if I became an artist, and wind up coughing my life away in a garret like Mimi in “La Boheme.” Also, they wanted me to be able to make a living at whatever career I chose, and being an artist is not exactly a path to riches for most people. I wasn’t sure how they would react to the special effects job, but when I told them, my mother said, “This is what you were born to do!” My family’s support continued when I decided to pursue fine-scale miniatures full time. My sister and brother-in-law even ordered a Craftsman style walnut house from me, and paid for it, no less! Any pieces you have made that you cannot part with? I still have the first 1/144 piece I ever made, which is an “in-progress” dollhouse on a table with a Yorkie by Carol Cardinal playing on the floor. The house is a resin casting by the Kummerows that I bought unfinished at a show. I was happy with it, but I did think I could do better. The rest is history! The only other piece I have kept is the very first walnut house I ever made. Mother came to visit right after I had finished it, and fell in love. 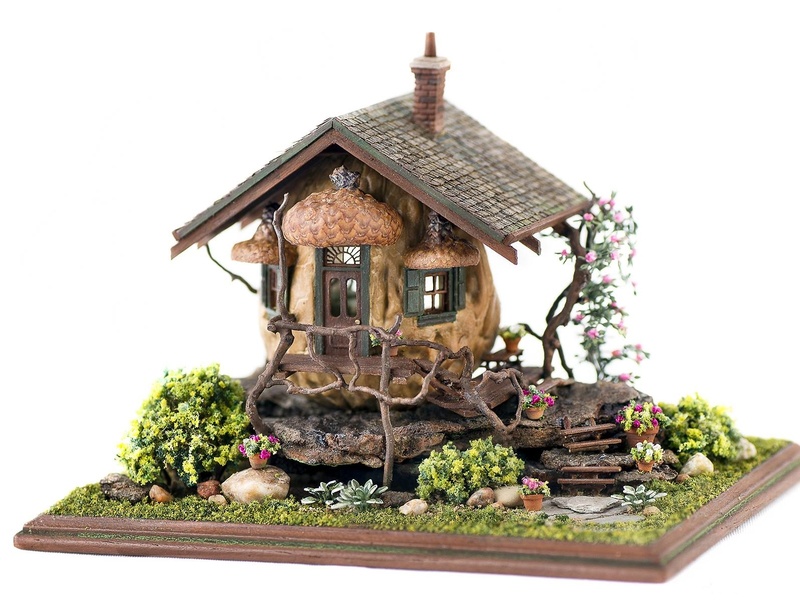 After she went home, she would call and say, “You haven’t sold my nut house, have you?” I knew orders when I heard them and gave it to her for her birthday. When she died, it came back to live with me. I smile whenever I look at it. I smile, too, whenever I look at the many creations by Nell Corkin in the collection. Be sure to click the images to see these pieces up close. Her detailed descriptions and the actual sizes of the items pictured are below. Please view her other work at Miniature Miniatures. Baroque Baby House: Inlaid walnut and exotic wood cabinet by Gilbert Mena with furnished rooms by myself. The first-floor kitchen has tiled walls and a display of blue and white Delft china. The second-floor salon has scenic paper on the walls and a faux marble fireplace and paneling. Sylvia Mobley made the tiny dog on a cushion near the fireplace. The third-floor bedchamber also has faux marble paneling, and a very elaborate canopy bed with hangings made from painted paper. Furnishings in all the rooms are scratch built from styrene and brass. I don’t use wood because the grains are really too big for 1/144 scale. The chandelier, candlesticks, andirons and other small details are etched brass. The rooms are approximately 1″ x 1″ x 1″. Walnut Cottage: Walnut houses are one of my signature pieces. Each is different, because I let the shape of the nut suggest what I’m going to do. The house is a real walnut, painted so that the color won’t change over time. It rests on chips of bark shed by the silver maple in our back yard. The main roof has paper “shake’ shingles; the awnings over the door and windows are acorn caps. The porch railing and roof supports are pieces of painted grapevine. The climbing rose is thin etched brass, and the flowers are snips of Bunka. The three Hosta plants in the foreground were assembled from individual molded styrene leaves. 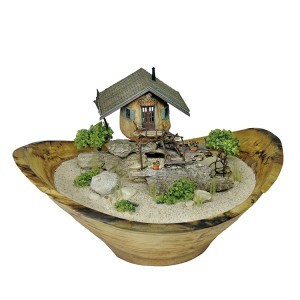 The rest of the landscape was created from model railroad materials, natural pebbles and bits of slate. The real terra cotta flowerpots were made by Braxton Payne. The furnishings include cast resin and scratch-built pieces. The headboard, curtain rods and support for the shelf over the door are made from tiny twigs to carry out the rustic theme. The walnut is about 1″ in diameter with the base measuring 3 1/2″w x 2 1/2″d. Cottage in the Dunes: The Cottage in the Dunes was inspired by a trip to the Leelanau Peninsula in northern Michigan. The sand, pebbles, twigs, driftwood and beach glass used in the house and landscape were all collected from beaches there. Most of my walnut houses have fireplaces, but this one has a wood stove, because that seemed more appropriate for a beach house. Placing the walnut houses in turned wooden bowls was my husband’s idea and I use bowls from a local artist, Gretchen Flo. The walnut is about about 1″ in diameter; the bowl is about 7″w x 5″d x 3″h. 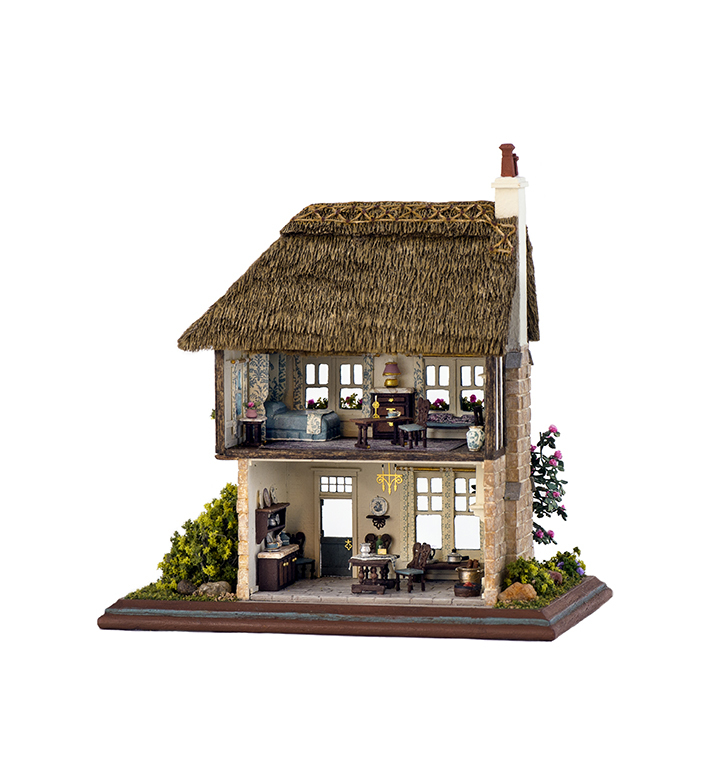 My Mother’s Dollhouse: As the name implies, this was inspired by my mother’s much-loved family dollhouse, although it doesn’t look exactly like it. 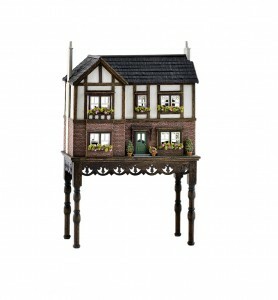 It is representative of commercially made Tudor Revival style dollhouses from her childhood. The interior reflects that era, with a 1920’s kitchen. Furnishings are scratch built and cast resin. Size with table is approximately 2 3/4″ w x 4 3/16″ h x 1 1/4″d. Storybook Cottage: This thatched cottage was a bit of a departure from the English-style houses I make. I just wanted to make something charming, so I gave it an unusual roof and a half door, and mostly scratch-built furnishings with a blue and white color scheme. The overall effect is rather French, but this little house doesn’t belong to any particular country. House is approximately 1 7/8″w x 2 1/2″ h x 1 1/8″d; base is 2 3/4″w x 1 3/4″d. The Summer Studio: This is a painter’s studio, so I gave it a big deck that could be used for plein air painting. The painting in progress on the easel is by Terry Junger, who does full size watercolor paintings. Studio building is about 1 3/8″w x 1″h x 1″d; base is 3″w x 2 1/2″d. My husband and I were delighted to visit your museum today! We love and cherish one on Nell’s pieces we acquired years back. It was one of the pieces she submitted to get her IGMA cube. It is an English manor house and the details are amazing. Nell’s artistry in 144th scale is unmatched..her attention to architectural detail draws one into the scene so completely. So glad you came to visit!